The personal budget template to be reviewed is another one that can not only be edited easily according to your needs, but it is also more easily readable. 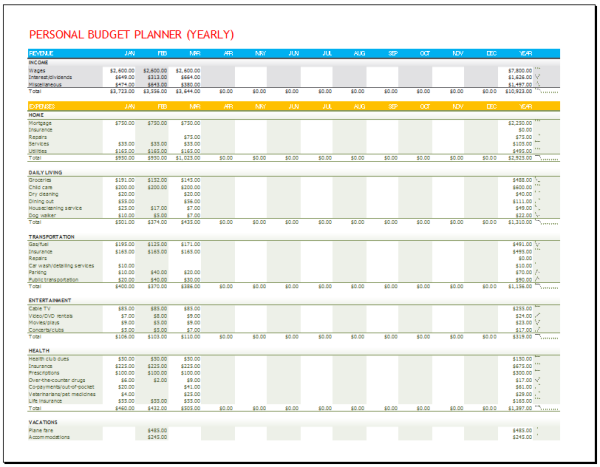 As opposed to the vertical layout of the previous personal budget planner , this one contains a layout that is more horizontal. Listed under the “income” section of this template is not only your general wages, but also dividends and miscellaneous funds. Following this are sections involving normal daily living, transportation, entertainment, and health – generally less sections than the previous template, but again, this is something that can be changed at your convenience. Perhaps the biggest difference in this template is that it is set up to be yearly rather than monthly.